The discipline of music occasionally seems very much like the discipline of competitive swimming. Every so often, in his mind, Drew Petersen compares the two, since he spent about 10 hours weekly in the pool as a high school athlete. “I just wish playing music burned a few more calories,” said the 24-year-old rising young recital and orchestral star. Three Fantasy Pieces by Charles Tomlinson Griffes, The Alcotts by Charles Ives, Attars by Judith Lang Zaimont and Sonatas by Elliott Carter and Samuel Barber. 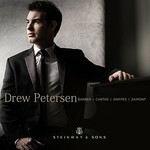 His new album will be released on the Steinway record label on July 20th.